We offer a wonderful maintenance program to maintain the view for your loyal guests. We clean the windows on some of the finest homes on the Outer Banks. We clean windows inside and out and wash screens thoroughly with a specialized screen cleaner and sealer solution then dry them with micro fiber towels. Windows are opened and mechanisms are wiped clean. We not only clean the glass on low rise office buildings we also wipe the frames and knock down the cob webs and wasp nests. Keeping your working environment clean is our pleasure. We carry two million dollars in liability insurance. Contracts are welcome. We would be glad to clean your hard to reach light fixtures or chandeliers. When they are cleaned properly by hand (not just sprayed off) they absolutely shine. We can also clean your exterior light fixtures inside and out. Clean windows are indicative of a well maintained home. Nothing says “buy me” like a well cared for clean house. 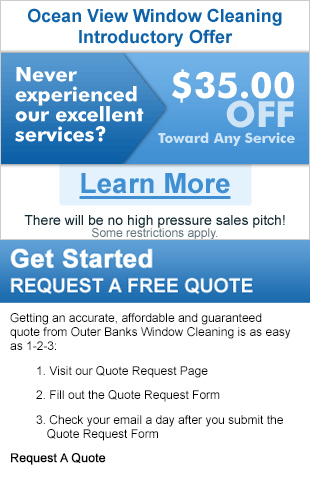 Your windows should be clean year round. Why wait? I’ll clean your windows when they need it, not just when it is warm but any month of the year.